UAE is hub of business in MENA region and occupies an important place among the business-friendly countries in the world. The country achieved this status mainly due to efforts of the emirate of Dubai that took initiative in adopting innovative policies for entrepreneurs and they are continuously improving these policies. A new such step is taken recently by Dubai SME, an agency of DED (Dubai Economic Development), for growth of small and medium businesses in the country by urging startups with new and innovative ideas in the business sector. 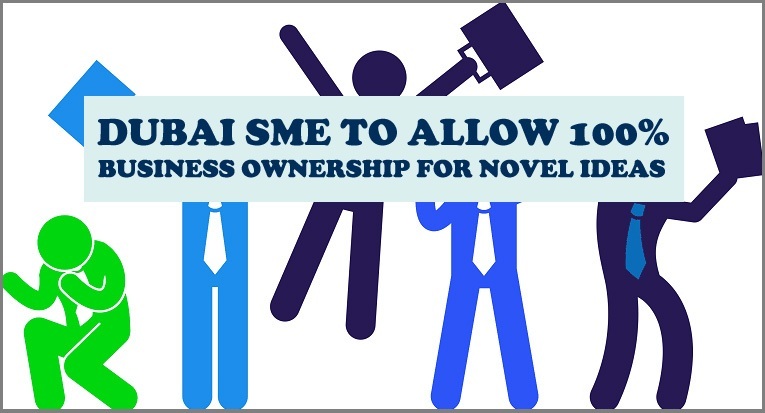 According to details, Dubai SME has offered 100% ownership to small and medium entrepreneurs if they are able to get Dubai SME’s business incubator license. Only those entrepreneurs will be provided with this facility who can present a completely new and innovative business idea. But just providing a novel business idea is not enough to attain this license, and the authorities will also check the possibility of execution of the idea. In general, 100% foreign ownership is only provided in free zones and foreigners can only avail 49% business ownership in Dubai mainland. But after this new announcement, now intelligent and innovative small and medium entrepreneurs will also be able to acquire 100% ownership of their businesses. This step shows that the government of Dubai is not taking measures to attract big businesses, but even small and medium entrepreneurs are also provided with incentives to grow this sector as well. Currently, SMEs are contributing 40% in the GDP of the emirate and the government is in effort to increase its share up to 45% by 2021. This step is especially helpful for fresh minds with new thinking and less capital, and they want to implement their ideas practically in their startup. According to experts, ICT (information & communication technology) and e-Commerce are two important sectors in the country as far as startup activity is concerned. Therefore, it is expected that the latest incentive by Dubai SME will benefit these two sectors the most. The government of Dubai is trying to establish DBIN (Dubai Business Incubator Network) in order to fully develop business incubator programs in the country. Regulation of incubators through such initiatives is the initial step in this regard. So, if you are a small or medium business startup with a new and exciting idea, then you can apply for Dubai SME business incubator license. You can contact Riz & Mona Consultancy via WhatsApp # 971-56-9971225 for further information and complete practical assistance. We are specialist in providing all types of trade licenses in Dubai and other parts of UAE. I am looking for 100% business ownership ideas. Thanks for some other great post. This will surely open door for businesses from small and large level. Keep up the good work. Thanks Agrawal for your interest in Riz & Mona Blog. Sure you can subscribe to business news, blog and other updates by email subscription. You will find it at bottom left on our home page under Newsletter section. This blog have rеmarkable and in fact extremely good information. Keep the good work.